Among the award-winning pieces: the admissions guide (top left cover, bottom), a Conservatory ad saluting The Muny's centennial (top, center), and a recruitment poster with the words to the Webster Athletics fight song. 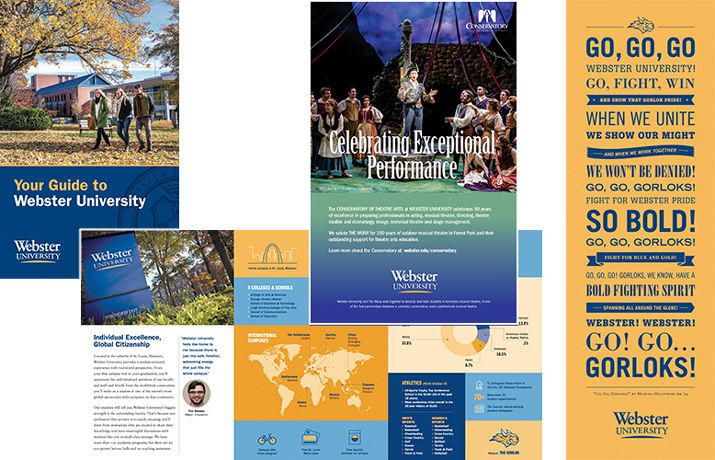 Webster University's Global Marketing & Communications (GMC) unit has earned nine more advertising and marketing industry awards for advertising and print production promoting admissions and recruitment, institutional branding, and the Conservatory of Theatre Arts. The awards for 2018 activities were received from the Service Industry Advertising Awards (SIAA), Collegiate Advertising Awards and the Educational Advertising Awards. Key members of GMC behind the award-winning pieces include Casey Conroy, Kiley Enno, Donna Franquemont, Erin Rivers and Christine Wells Eason. Below are the awards received from each organization and the ad, poster or brochure that was recognized. The "Go, Go, Gorloks!" poster depicts the lyrics to the University's athletics "fight song." 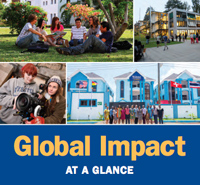 The "Global Impact at a Glance" brochure provides an overview of Webster's reach. The "Guide to Webster University" is used for student recruitment and admissions. The Conservatory of Theatre Arts ad in The Muny program saluted that historic theater's 100th anniversary. See a broader list of recent GMC awards here.